On November 16, Jesper Kyd's latest project, Assassin's Creed 2, will be available, but we give you an advanced listen to 5 tracks from the upcoming, 35 track release! 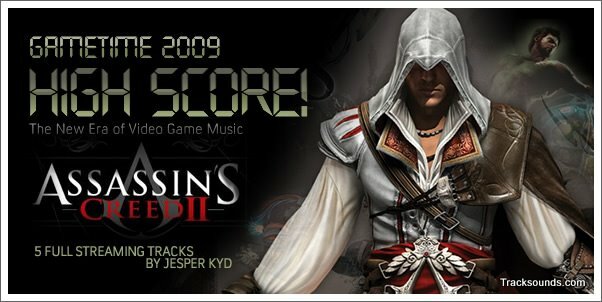 Award-winning composer Jesper Kyd has created an epic soundtrack for Assassin's Creed II, the sequel to the fastest-selling new IP in video game history. Following his atmospheric score for the original Assassin's Creed, Kyd takes the music in an adventurous new direction and crafts an immensely diverse, melodic and progressive musical palette featuring acoustic and symphonic orchestrations with emotional depth and diversity. The original score was recorded with A-List musicians and a Hollywood orchestra and choir at the world-renowned Capitol Studios. The Assassin's Creed II Original Soundtrack will be available for digital download from popular music stores on November 16th. Assassin's Creed II features a new hero, Ezio Auditore da Firenze, a young Italian noble, and a new era, the Renaissance. The game tells an epic story of family, vengeance and conspiracy set in the pristine, yet brutal, backdrop of a Renaissance Italy. Ezio befriends Leonardo da Vinci, takes on Florence’s most powerful families and ventures throughout the canals of Venice where he learns to become a master assassin. The music propels the action, captures the allure and mystery of the story and immerses players in the breathtakingly detailed settings. Patrice Desilets, Creative Director at Ubisoft: "Jesper Kyd’s score for Assassin’s Creed II brings players into the Italian Renaissance by providing a true sense of depth for the poignant moments, while also giving a jolt of adrenaline to the action-packed sequences. We are thrilled to have Jesper Kyd back with us in making Assassin’s Creed II an epic title on all levels." Jesper Kyd: "We created a unique musical identity for Assassin's Creed II that reflects the character and story of Ezio and elevated the music, both in terms of creativity and live production, to a whole new level." Assassin’s Creed II is the product of over two years of intensive development by the original creative team behind the Assassin’s Creed brand. Assassin’s Creed II is scheduled to launch on November 17th, 2009 for the PLAYSTATION® 3 computer entertainment system, the Xbox 360® video game and entertainment system from Microsoft and the PC. For more information about Assassin’s Creed II, please visit http://www.assassinscreed.com/.